So called seizure response dogs provide support for people with epilepsy by helping prevent unintentional injuries during and after a seizure. 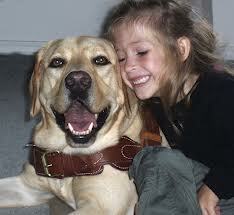 Some of these seizure dogs are able to predict when their owner is going to have a seizure. The dog will alert the person by whining, pawing or circling. There are many stories of this happening but scientists are not sure as to how and why some dogs seem to have this ability. Many people suspect that the dogs respond to very suttle visual or hearing changes that occur during the early stages of a seizure. Some research suggest that the dogs are responding to psychological not epileptic seizures. Regardless, it shows how strong the bond can be between people and pets. These dogs deserve special gifts of treats, a new fleece dog coat or even a big hug!! This entry was posted on Thursday, December 18th, 2014 at 5:14 pm	and is filed under Pet Supplies. You can follow any responses to this entry through the RSS 2.0 feed. Both comments and pings are currently closed.